To ask other readers questions about Letters of a Woman Homesteader, please sign up. The synopsis here on goodreads describing a book about women of the South by someone named Abbott is not about this book (Letters of a Woman Homesteader) which is by Elinore Pruitt Stewart and is about Wyoming. How to I alert the website about this mistake? Brenda The above has been corrected. This lady had everything needed by the pioneer women. She was smart, kind, strong, not afraid of hard work, inventive, humble, had a great sense of humor and love of life. It never fails to amaze me when reading accounts of this type at how much people could get done in a week or a month or a year. Yeah, that's the thing about hard work....It gets things accomplished. Leaves very little time for whining and complaining. I very much enjoyed these letters describing a homesteader's life in Wyoming This lady had everything needed by the pioneer women. She was smart, kind, strong, not afraid of hard work, inventive, humble, had a great sense of humor and love of life. It never fails to amaze me when reading accounts of this type at how much people could get done in a week or a month or a year. Yeah, that's the thing about hard work....It gets things accomplished. Leaves very little time for whining and complaining. This is one of my favorite books of all time, and I have probably read it at least a dozen times. This is the story of a person who followed her heart and worked incredibly hard; the end result is that she built a life she loved. Set in Wyoming at the start of the 20th century, Stewart (a widowed single mother)left the drudgery of taking in wash to work on a cattle ranch and prove up her own piece of land for homesteading. She writes with wonderful droll humor and remarkable insight to the human This is one of my favorite books of all time, and I have probably read it at least a dozen times. This is the story of a person who followed her heart and worked incredibly hard; the end result is that she built a life she loved. Set in Wyoming at the start of the 20th century, Stewart (a widowed single mother)left the drudgery of taking in wash to work on a cattle ranch and prove up her own piece of land for homesteading. One of my friends sent me her worn out copy of this book as a loaner, because she believed it was such a great book. When it arrived it was so worn out from so many hands reading it. I loved it, so I suggested it for our book group and read it again. What makes this story so good? First, it is a true story written in the very early 1900s by a woman who had lost her husband and had then taken on a job as a housekeeper for a rancher in Wyoming. Along with the job, she had purchased land next to her new boss, intending to homestead it. She then began writing eloquent letters to her former boss, letters that were filled with adventure, as well as her life on the ranch. What makes this story so good is the fact that she didn’t talk about mundane things, instead she had adventures, but a few things are mundane, like talking about the food they are eating, no so mundane to me. I knew that I would have had to develop a taste for venision, for example, but some of the meals were really good. Then there is a story of her taking her young daughter on a camping trip when she knew that it could snow. They spent the night 30 miles from home, sleeping under a tree whose branches came to the ground. The idea was squeeze between the branches, blocking out access to wild animals like bears or cougars. Good luck, especially since she had built a campfire and was cooking their dinner, which could have attracted bears. When they woke up the next morning snow had covered the ground. This is when I began questioning her common sense, but then people have questioned my own over the years when I was on my own adventures. So now they had to find their way home. A 30 mile rope connected to her home would have been a good idea. Ha. Books like this remind me of The Long Winter by Laura Ingalls Wilder or Thirty Six Hours of Hell by E.N. Coones. And right now I am thinking of the -100 degree windchill factor in New Hampshire and wondering how people and their livestock are surviving, and then wondering how they would keep their homes warm. Other stories in this book were just not fascinating but caring as well. Taking food to a starving family, and then on Christmas taking food to the sheepherders in the area, which would make this a good Christmas book. Of course I rate this book a five because my great grandmother wrote it and I can relate to it because of my grandmother's stories about growing up. However, if I was not related, I would still love this book because it is very similar in style to Jack London's prose. It has historical and sentimental value. Elinore Pruitt Stuart me deja admirada y maravillada tras leer estas cartas llenas de encanto, humor y un amor por la naturaleza y el prójimo altamente contagioso. I have fallen in love with Elinore Pruitt Stuart. For one thing, she's witty and kind. For another, I love her philosophy of scaring off troubles with a belly laugh. She's a keen observer of people and loves and can describe natural beauty. She is independent, curious, loyal, likes to eat, is kind to children and animals, is not afraid of hard work, is open-minded, and is honest enough to laugh at herself when she is wrong. She seems to have made friends easily, which is natural probably for som I have fallen in love with Elinore Pruitt Stuart. For one thing, she's witty and kind. For another, I love her philosophy of scaring off troubles with a belly laugh. She's a keen observer of people and loves and can describe natural beauty. She is independent, curious, loyal, likes to eat, is kind to children and animals, is not afraid of hard work, is open-minded, and is honest enough to laugh at herself when she is wrong. She seems to have made friends easily, which is natural probably for someone who is a cheerful, sympathetic listener, rejoices in the joys of others, and enjoys work. At a hotel where she happens to be staying once night with her young daughter, she meets an older male acquaintance who is meeting his fiancée of twenty-five years who he hasn't seen in as long. On finding out that she is going to be married on arrival but that no preparations have been made, Pruitt invites herself to the wedding meal. In the course of decorating a partially built room, arranging a feast, and seeking hot water for the dusty bride's toilette, she ends up helping in the kitchen of the hotel because the landlady doesn't have enough help and a full house. She loses track of the time because she's having so much fun. The woman is not perfect, nor are these perfect times, by any means, but it's an interesting picture of Wyoming society around 1910. At one point, Pruitt goes to a Mormon community and has a bunch of questions all ready for the 'bishop', but he is away. She and a friend end up staying at his second wife's home and being unable to bring herself to ask the questions because she has such pity for wife's situation. (The woman does talk about her husband and gives details of her domestic arrangements on the instigation of Pruitt's friend.) That she's not partial to Mormonism doesn't bother me. She's open about her opinions and is frankly interested in the phenomenon. It's a difference in belief. She is however horribly patronizing to and about "negroes." When she sees a black man on a train she guess he expects to be called "mister" and says that she'd learned after migrating to Wyoming from the South she could no longer call black people "uncle" and "auntie" as she had been used to do. It's disappointing how racist some of my homesteading heroines are. Laura Ingalls Wilder is also not free of prejudice and ignorance, though hers is directed toward native Americans. In the back of my mind while reading this was the thought that the holy homestead act that gave white women like Pruitt such opportunity for independence was destructive of native cultures as well contributing significantly to the environmental disasters of the dust-bowl and extermination of the bison. So there's that. But Elinore is some good company. No tengo palabras para describir lo que he disfrutado leyendo este libro. Me ha resultado delicioso. Las cartas escritas por Elinore hace tantos años, te trasladan a una época perdida, a una forma de vida en contacto con la naturaleza, de solidaridad entre vecinos y de amistades para toda la vida. Y también transmiten fuerza y vivacidad. Fuerza de una mujer que escapó de los estereotipos de su época, y que decidió tomar las riendas de su vida e irse a una nueva tierra para empezar de nuevo con su No tengo palabras para describir lo que he disfrutado leyendo este libro. Me ha resultado delicioso. Y también transmiten fuerza y vivacidad. Fuerza de una mujer que escapó de los estereotipos de su época, y que decidió tomar las riendas de su vida e irse a una nueva tierra para empezar de nuevo con su hija y con su propia hacienda. Vivacidad al leer como no tenía ningún problema en irse a la montaña para acampar bajo las estrellas y disfrutar de la naturaleza, o recorrer millas para ayudar a una familia necesitada. Un libro precioso y sencillo sobre una mujer fuerte, valiente, optimista, y amante de la naturaleza. Es un libro que huele a empoderamiento, pino y a bollitos calientes. Una delicia. Right now the Kindle version if free at Amazon. Definitely love this book. Thank God for pioneer women! Me ha gustado mucho, hay cartas que se hacen algo pesadas, pero las descripciones, las aventuras que narra y sobre todo el carácter de la autora es una maravilla, está plagada de positivismo y alegría. Da gusto encontrarse personajes así. When I read of the hard times among the Denver poor, I feel like urging them every one to get out and file on land. I am very enthusiastic about women homesteading. It really requires less strength and labour to raise plenty to satisfy a large family than it does to go out to wash, with the added satisfaction of knowing that their job will not be lost to them if they care to keep it. Any woman who can stand her own company, can see the beauty of the sunset, loves growing things, and is willing to put in as much time and careful labor as she does over the washtub, can certainly succeed. In her discourse one can also see the seeds of the more recent trend of returning to nature and agriculture as a mean to connect mankind to the land. But if the passages I mention sound a bit preachy, the bulk of the letters are a colorful chronicle of the place and people she meets and often befriends. Elinore is poetic at times, describing sunsets and sunrises or early snow, and shows a strength of character to border the insufferable: when no minister or priest was available, she conduct the funeral service for her new-born son. I am so happy these letters were saved and printed. No, they are not highly literary, but they bear witnesses to a whole generation of pioneers and their boldness. These letters make for a fascinating narrative and descriptive journal of Mrs. Stewart's life, moving from the city to a Wyoming homestead, marrying and still having the determination to homestead ON HER OWN. She is a very positive, optimistic individual, generous and giving, nearly always seeing the positive in others. Her words and attitude are inspirational. Whether tidbits are fabricated or exaggerated is a bit of topic of debate. However, the general storylines, characters, and situations ar These letters make for a fascinating narrative and descriptive journal of Mrs. Stewart's life, moving from the city to a Wyoming homestead, marrying and still having the determination to homestead ON HER OWN. She is a very positive, optimistic individual, generous and giving, nearly always seeing the positive in others. Her words and attitude are inspirational. Whether tidbits are fabricated or exaggerated is a bit of topic of debate. However, the general storylines, characters, and situations are nonfiction, and it is quite fascinating to see the interrelations of early Western life, homesteading and cattle ranching. Mrs. Stewart always leaves a few choice words regarding her luck and love in life. She sees the beauty in everything: "Everything, even the barrenness, was beautiful" (28). She incorporates some faith (though seemingly nondenominational) into her awe with Wyoming's natural beauty: "when you get among such grandeur you get to feel how little you are and how foolish is human endeavor, except that which reunites us with the mighty force called God" (30). Choice bits of attitude and knowledge: "I am the luckiest woman in finding really lovely people and having really happy experiences. Good things are constantly happening to me" (62). "Those who try know that strength and knowledge come with doing" (282). She is humorous (and loves camping): "fastidiousness about food is a good thing to get rid of when you come West to camp" (166). And she can maintain a wintry mountain scene with pure love and passion, bubbling up your own feelings and sentiments: "I love the flicker of an open fire, the smell of the pines, the pure, sweet air, and I went to sleep thinking how blest I was to be able to enjoy the things I love most" (198). I first read this just a little over three years ago, and I loved it immediately. I'm happy to report that I love it still. How absolutely delightful it is! I smiled and chuckled and cheered throughout it. Elinore Pruitt Rupert, a widow with a young daughter, took a job keeping house for a man named Clyde Stewart out on the plains of Wyoming in 1909. She wanted to try homesteading for herself, but knew she'd need some way of keeping herself and her daughter until she had her homestead up and runn I first read this just a little over three years ago, and I loved it immediately. I'm happy to report that I love it still. How absolutely delightful it is! I smiled and chuckled and cheered throughout it. Elinore Pruitt Rupert, a widow with a young daughter, took a job keeping house for a man named Clyde Stewart out on the plains of Wyoming in 1909. She wanted to try homesteading for herself, but knew she'd need some way of keeping herself and her daughter until she had her homestead up and running, so hit upon the idea of keeping house for some established rancher or farmer to begin with. But she insisted on doing the work of homesteading on her own to see if a determined woman could make a go of it. And make a go of it, she certainly did. I thoroughly enjoyed reading this series of letters written by a young widow on the Wyoming frontier, sent regularly from 1909 to 1913 to her friend back home in Denver. Since the letters were not originally intended for publication, they are very personal and chatty, and I felt when reading them as if I had stumbled onto a dusty pile of letters from a long-gone great-grandmother and was discovering a piece of forgotten family history for the first time. This is part of the charm of this book; i I thoroughly enjoyed reading this series of letters written by a young widow on the Wyoming frontier, sent regularly from 1909 to 1913 to her friend back home in Denver. Since the letters were not originally intended for publication, they are very personal and chatty, and I felt when reading them as if I had stumbled onto a dusty pile of letters from a long-gone great-grandmother and was discovering a piece of forgotten family history for the first time. This is part of the charm of this book; it is the perfect rainy afternoon read. I had all but the last two chapters of this book read in July. I have several books (five, I believe) in the same state that I just need to wrap up. Since I had already listened to the audio version of this book last year, I felt prepared for book club, even without the last part. I enjoyed my second read of this book as much as the first time. It is really a very delightful book. This book is a compilation of letters written by a woman who homesteads in Wyoming. The stories she tells are deligh I had all but the last two chapters of this book read in July. I have several books (five, I believe) in the same state that I just need to wrap up. Since I had already listened to the audio version of this book last year, I felt prepared for book club, even without the last part. I enjoyed my second read of this book as much as the first time. It is really a very delightful book. This book is a compilation of letters written by a woman who homesteads in Wyoming. The stories she tells are delightful. This book was made extra enjoyable with the addition of book club. We enjoyed a delicious dinner of dutch oven, pies, homemade lemonade and root beer, homemade bread and jams, fresh garden veggies, homemade cheese etc! Mara had done a great job of decorating despite having to move into her garage due to a rain shower. The bonus of the night was having a guest speaker and expert on Elinore Pruitt Stewart. I loved her pictures of the actual homestead and extra bits of info that you don't learn in the book. For instance, how the letters were published by her friend in Denver, one letter at a time before Elinore even knew they were being published. Also, about her early life. 4.5 stars if it were possible. I enjoyed the voice of the MC in this autobiography via letters. She was a single parent and a homesteader. It was 'mighty powerful' to use a term that she used a lot. Her voice felt so authentic. I love reading about the pioneer spirit and she had a double helping. I loved her descriptions of the people and the places. This book was a quick read and it was fun. "It is true, I want a great many things I haven't got, but I don't want them enough to be discontented, and not enjoy the many blessings that are mine." I think this is now one of my favorite books. I loved the history, the grit and determination, the nature and geography, and most of all Elinor's wit and humor. I would somewhat describe her as a homesteader Anne of Green Gables. Her optimistic letters give a picture of true life on the range but still a hopeful view. I loved it and will read it "It is true, I want a great many things I haven't got, but I don't want them enough to be discontented, and not enjoy the many blessings that are mine." I think this is now one of my favorite books. I loved the history, the grit and determination, the nature and geography, and most of all Elinor's wit and humor. I would somewhat describe her as a homesteader Anne of Green Gables. Her optimistic letters give a picture of true life on the range but still a hopeful view. I loved it and will read it again and again. It only took me a day to read/listen. I found myself trying to listen to it at every moment available. Probably one of my most favorite things to read are the Little House series by Laura Ingalls Wilder. Aside from getting all atwitter over exact instructions on how to make my own meat smokehouse, I love the parts of the books that focus on the gritty side of life - like having to deal with Nellie Oleson, or the very real possibility of being killed in a freak blizzard, or tornado season. What can I say, I like drama. Letters of a Woman Homesteader reminds me of a more grown-up, dramatic, and shor Probably one of my most favorite things to read are the Little House series by Laura Ingalls Wilder. Aside from getting all atwitter over exact instructions on how to make my own meat smokehouse, I love the parts of the books that focus on the gritty side of life - like having to deal with Nellie Oleson, or the very real possibility of being killed in a freak blizzard, or tornado season. What can I say, I like drama. Letters of a Woman Homesteader reminds me of a more grown-up, dramatic, and shorter version of the Little House books. This is a non-fiction book that is a collection of letters from Elinore Pruitt Stewart to a former employer. Elinore is a widow with a daughter, and decides to leave the South and go to Wyoming in search of a better life. She is a complete anomaly - she has no husband to care for her, and she actually wants to claim her own land. Gasp! Elinore's writing is at times really funny and snarky. I love her sense of individualism and adventure. At one point, she just strikes out with her young daughter and a few horses, determined to see what the land is like around her. They are hit with a blizzard, and find themselves almost completely snowed in, and lost. This story, like many of the stories in this book, ends with Elinore finding a new and eccentric friend, and all goes well. Of course, there are some really sad events in this book. It's interesting to see what kind of people left for Wyoming - many of them are running from a failed relationship, a family death, or some other tragedy. Although Elinore's daughter Jerrine is well cared for, many of the other children lead sad lives, and of course, some don't survive the rough conditions. It was really surprising to think that these people are basically stranded out in the wilderness, with no telephones, spotty postal service, and hardly any police to think of. Yet somehow, they seem to be living better than most of us! This book also has probably the scariest story about a criminal that I've ever heard of in my life. If nothing else, read it for that. Seriously, it's terrifying! I feel like I have to warn you that there are, sadly, some outdated and offensive racial terms in this book. It's unfortunate, because Elinore is so intelligent and educated, but even she can't escape being a product of her times. It really only occurs once, and I hope you can overlook the nastiness and get on with the book. There is also a very interesting description of going to Utah and visiting with the Mormons there. I suspect some modern day Mormons would object to the descriptions of the misogyny that exists and some other flaws, but I don't know. You can make your own decision after reading. Literally sick from the hard work and poor living conditions in Denver, widowed Elinore took her ~4 year old daughter and settled in the wilds of Wyoming. Although the territory was largely unpeopled and filled with physical hardship, Elinore loved it. She wrote amusing letters filled with anecdotes to her friends back home; this is a collection of some of them. Her descriptions of the beautiful landscapes and odd people she encounters are wonderfully wrought. Altogether, it's rather like a sarc Literally sick from the hard work and poor living conditions in Denver, widowed Elinore took her ~4 year old daughter and settled in the wilds of Wyoming. Although the territory was largely unpeopled and filled with physical hardship, Elinore loved it. She wrote amusing letters filled with anecdotes to her friends back home; this is a collection of some of them. Her descriptions of the beautiful landscapes and odd people she encounters are wonderfully wrought. Altogether, it's rather like a sarcastic, grown-up version of the Little House books. I've been a fan of the accounts of homesteaders and pioneers on the Oregon trail since I was a child. Give me a whole chapter on how one makes butter in the winter and I'm happy. Is it time to build a new lean-to? Tell me all about it. Farming potatoes on new land? I'm all ears. So, Letters of a Woman Homesteader was, to me, the perfect collection of stories which follow the true life of Elinore Pruitt Stewart, a woman who took her young daughter to claim some land in Burnt Fork, Wyoming in 1909 I've been a fan of the accounts of homesteaders and pioneers on the Oregon trail since I was a child. Give me a whole chapter on how one makes butter in the winter and I'm happy. Is it time to build a new lean-to? Tell me all about it. Farming potatoes on new land? I'm all ears. 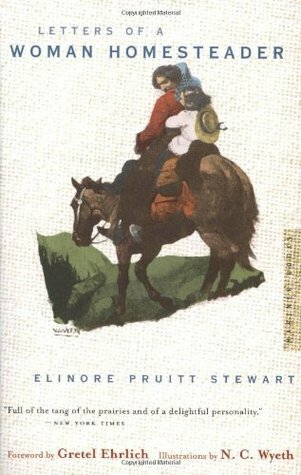 So, Letters of a Woman Homesteader was, to me, the perfect collection of stories which follow the true life of Elinore Pruitt Stewart, a woman who took her young daughter to claim some land in Burnt Fork, Wyoming in 1909. The book is told through a series of letters written to her old employer over the years, and Stewart is a beautiful writer; even sitting on the Q train in Brooklyn I would find myself in the barely touched beauty of the land she begins to call home.